"Hansel and Gretel" by the Brothers Grimm is probably one of the most famous German fairy tales. The siblings got lost in the woods after their stepmother put them out in the forest. Hungry, they searched the way back and came to a house made of bread and covered with cakes. The windows were made of light sugar - as sugary as our nutcracker girl Chubby Gretel. Her hand-braided blond braids are unique. The outfit matched with red hearts and a gingerbread on the chest. 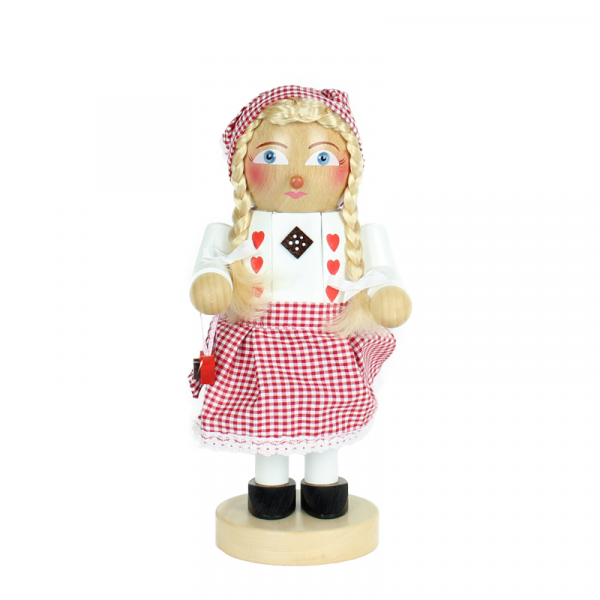 A fairytale pearl - made in the heart of the Erzgebirge and "Handmade by Steinbach". Related links to "Chubby Gretel"